We are deeply saddened over the loss of our extended family-member, Tami Robus, who passed away at the end of September. 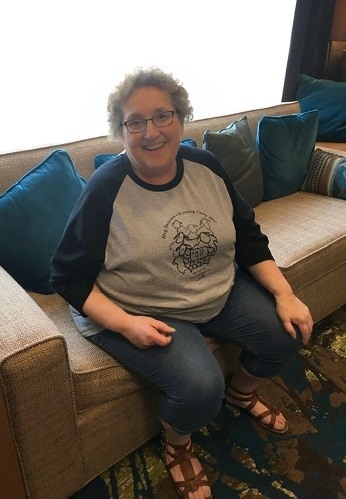 Many of you knew her as the voice of Schoolhouse Press; our office manager and Knitting Camp organizer who helped you with wool orders, knitting difficulties, and Camp questions for the past 17 years. 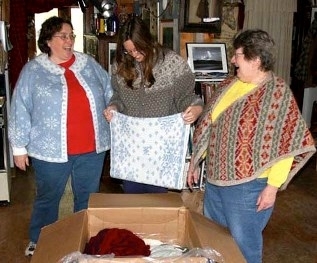 This photos of Tami, Michelle, and Eleanor - having a good laugh - was taken as we unpacked a box of double-knitted garments from M’Lou Babar, while working on her book Double Knitting. 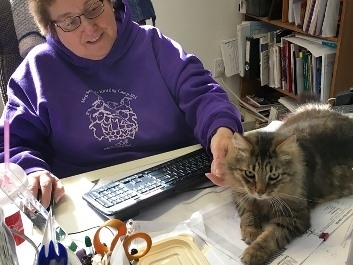 Tami at her desk with a young Bill. Thank you for allowing later comments to be posted, I only now just saw this in December 2018. Tami was truly the voice and heart of Schoolhouse Press to me and she absolutely embodied what ideal customer service consists of - it was apparent that her great pride was in making customers happy with how SHP treated them, and she is what has led me to always think of SHP first for my book and wool needs. I will think of her with fondness always and I hope her family may hear yet another voice remarking on how exceptionally gifted and gracious an ambassador she was for SHP and for fiber arts. I just found out today 11/12/2018... My friend Michelle and I went to the 44 camp. We finally managed it...Tami was the key to us coming for sure. Spoke to her for years on the phone, talking about our kids and families. So happy we got to finally meet in person...stole her away one evening for dinner. That was wonderful to spend time with such a spectacular lady. I won't lie I burst into tears when I read Michelle's note back to me responding to my order. Tami became a special friend from many miles away. She will be missed. I'm grateful to have known Tami at Camp over the years. She was a great lady with such moxie that she will never be forgotten. Thank you for this notification and the pictures. I have such good memories of Tami answering my questions and helping me by phone. It's like a part of me is missing, too. I send a fond farewell to a kind soul. I'm a bit shocked to learn this - Tami has always been so wonderful handling my orders and queries and so helpful when I've been floundering with what to order that it somehow just didn't seem possible that one day Tami won't be there. My condolences to all Tami's friends and family - and my gratitude to Tami for the years of friendly, helpful service. Tami was an integral part of my experience at Camp. Years ago, when I first started knitting, I ordered some wool online from SHP in July. A few days after I placed the order, I got an email from Tami that said 'Hi Matt. I'm so sorry for the delays - I'll get your order out today!' Now, I was new to ordering stuff online, and I didn't even think there was a delay at all, so I replied to her that it was no big deal, and to just send it when ever she got a chance. Her reply to me was 'We've been busy with Camp, and she apologized for the delays'. Wait. What? Camp? What was this Camp thing? She got me hooked from that moment on. She was so sweet to me from that day forward. My first Camp was the following Summer. My whole Camp Group loved Tami, and we will miss her sweet voice and kindness. My condolences on Tami's passing. I remember meeting her at Camp when I was there eons ago. She was warm, welcoming & very helpful.